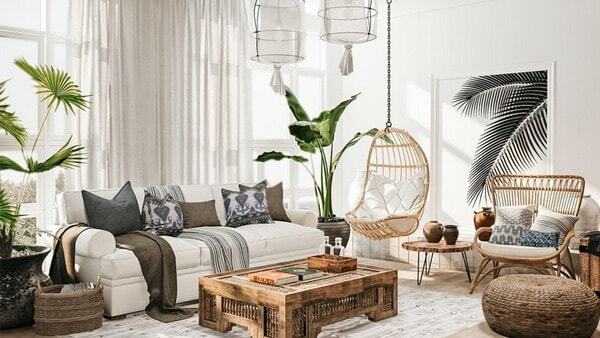 If you liked our interior design trends 2019 that we proposed in a previous article of Indecortrends, you will enjoy even more with the news that we propose below. But this time, instead of decorative styles, we are going to talk about concrete pieces: from furniture to small accessories. And, of course, also designs and prints. Are you curious? Do not miss the trends of interior design 2019. Although mathematics was not your strong point in school, you will surely approve the geometry class applied to decoration. And is that this 2019 will continue to be fashionable geometric designs. Rhombos, squares, rectangles and many other geometric shapes that are present both in prints and in the structure of the furniture. Although, this 2019, will be the great year of carpets with geometric print. Designs that are perfect to give a twist to the decoration, add a touch of modernity and introduce contrasts and textures that break the uniformity of the simplest environments. The sophisticated and chic point comes in charge of the gold pieces. Our preferred proposal? The auxiliary tables in metal and gold sparkles will be protagonists of this 2019. Pieces with geometric structure that put a glam touch that adapts to all types of spaces: as an auxiliary table next to an armchair, as a bedside table, etc. The gold will also be present this year in small whims like vases of exuberant design. So incredibly decorative pieces that work alone, without the need to accompany them with any flower (either natural or artificial). Although we are talking about gold, other metallic surfaces such as copper will also be present this year. And, like the gold, the copper flashes are carried both in auxiliary furniture and in vases, lamps, lanterns and round mirrors with a gold or copper frame, among many other pieces. We do not tire of repeating it, the natural works and it is also fashionable. Applied to decoration, this natural tendency is present through natural materials such as natural noble wood, without treatments, varnishes and oils of any kind. And, of course, vegetable fibers. Sisal, coconut, rattan, jute, etc. All these vegetable fibers refresh and lighten the decoration and will be a trend in 2019. And how will they be present this year? 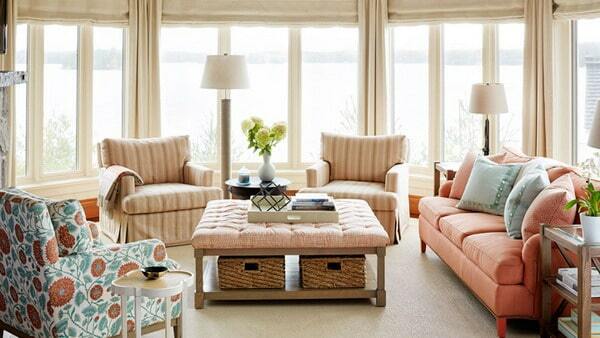 In grid furniture, both chairs and screens, cabinets, headboards, lamps, carpets, etc. That is, natural fibers conquer both the exterior and the interior of the house. 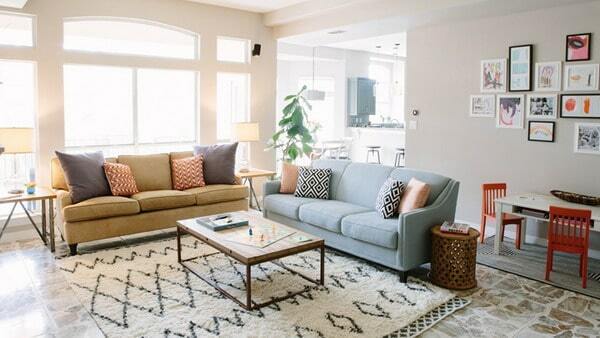 In fact, this type of furniture is perfect to connect the interior of our house with the outside. In furniture, showcases and, of course, also on the walls. The wallpaper will be trend this 2019. A trend that we recover strongly and that is displayed in a variety of designs and styles. The preferred one? 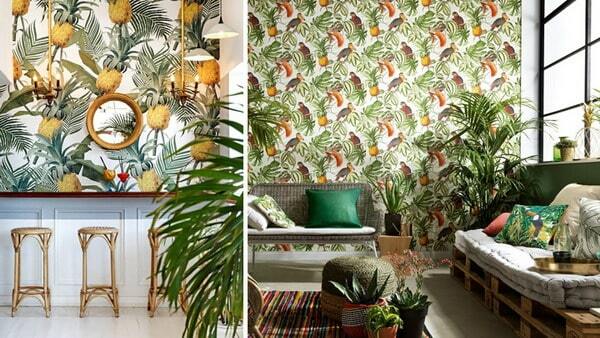 Tropical and exotic motifs that refresh the spaces and add a chic touch. The wallpaper is ideal to give a twist to an interior, without having to do works and without spending a lot of money. Although it also helps us to highlight an environment or a specific piece. For example, on the wall of the hall or the bottom of the shelves of a shelf. 2019 will be the year of the usual materials, forgotten for a long time, and finally recovered. And the terrazzo is one of them. Relegated for years to a second plane, the terrazzo returns to give a touch of trend to all types of furniture and accessories. This mixture of marble, natural stones and pigments, serves to cover countertops in bathrooms and kitchens, and even tables and lamps of modern and minimalist design.